Spend an evening with Tarte Noire and people from your local community sharing your stories and witnessing those stories transformed into art. The Sea Light, Dawlish invites both men and women to a night of coming together as a community to share heart-felt stories. Time: Doors open at 7:30pm, no admittance after 8.00pm. Tarte Noir - Transforming memories into magical living theatre. 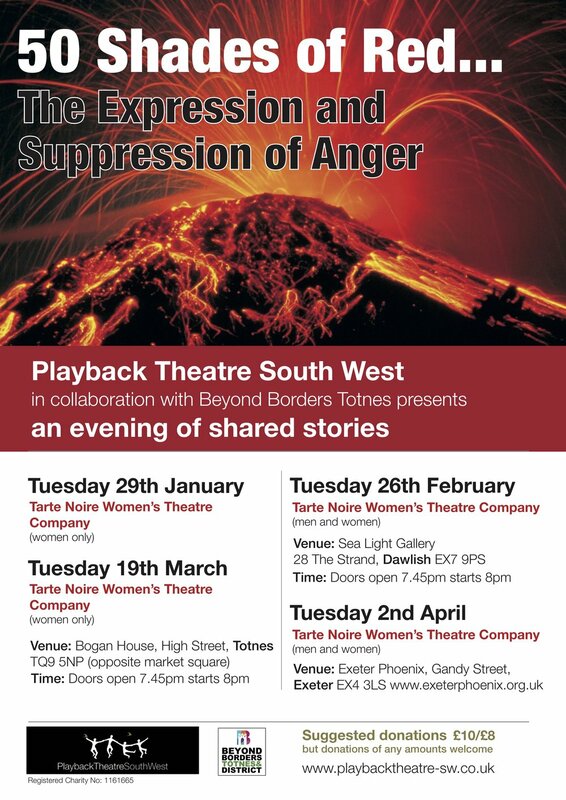 Tarte Noire is a women's playback theatre company, based in South Devon, who create theatre performances that are dedicated to exploring and affirming the everyday stories and experiences that affect women's lives. Playback is a form of spontaneous improvised theatre in which the audience are invited to share their own personal stories before watching their words transformed into live theatre before their eyes. Performances can be moving, challenging, funny, poignant and extraordinary! During a Tarte Noire performance, the audience are drawn together as they witness the enactments. Through this spontaneous improvised theatre form we seek to create art and beauty as a way of acknowledging the fullness of our human experience. We invite conversations between people where we can explore together and see reflected the reality and mystery of our lives. A space is created to enjoy listening deeply to each other. We have become aware that this work removes feelings of isolation and creates intimacy between people. Every voice is welcome. Time: Doors open at 6:30pm no admittance after 8.00 pm.